Starting today, color schemes on all 2.0 PBwikis are free! Earlier, color schemes were a Premium feature. But since we’ve heard more and more of you asking to use colors to customize your wikis, we realized it makes sense to offer them to everyone. With the release of the new settings panel, we’re giving away all 9 of the pro color schemes to all our wonderful users, free of charge! These include colors like Silver, Plum, and Blue. To add a new color scheme to your wiki, click “Settings” in your 2.0 wiki. Update: Edited for clarity. 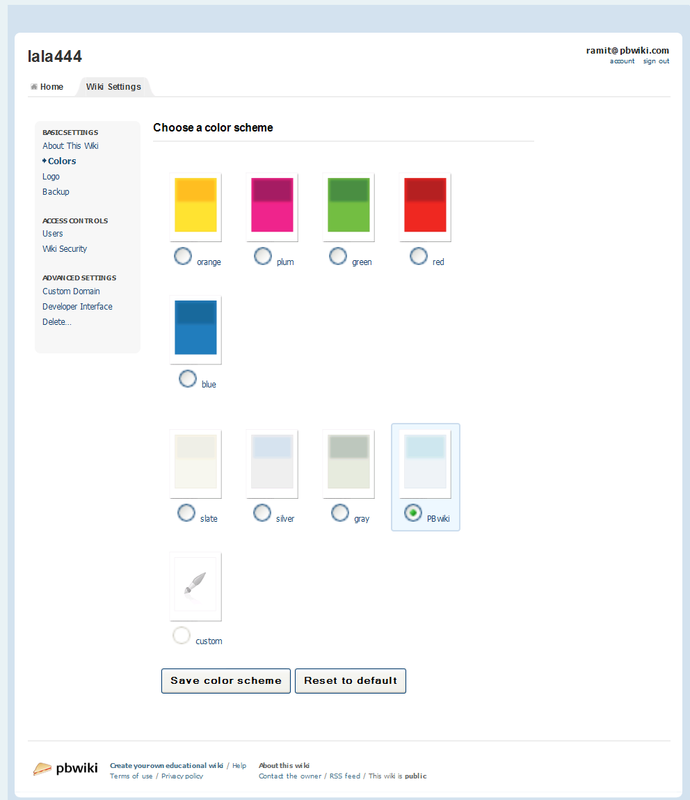 The “Custom” color option which allows you to create your own color scheme is still a Premium feature. when will my wikis show a 2.0 flag so I can upgrade my classroom wiki. That’s fantastic. I might now switch over to version 2. Hmmm, what am I missing here? I click on Settings–>Colors and the option to choose a Custom Color is listed as a Premium Feature. I can choose one of the 9 color schemes (green, plum, etc. ), but “custom” is not available. The title of this post and the first sentence indicate that custom colors are now free. Thanks for pointing this out! I’ve edited the post to clarify this issue. The color schemes are free now, and the custom option remains a premium feature. Sorry if the original post was misleading! This is a great addition. I always feel that colors do light up and influence the readers responses. It is wonderful that you are incuding this as a free feature.